Launched in 1948, TRESemm? was named after renowned hair care expert Edna Emm?. Up until the 1950's, TRESemm? was sold only in salons. Today it is available at a shop near you, so that you can have salon-style hair at home. For over 60 years, TRESemm? has built a history of success in 13 countries around the world. From its origins in 1947 and salon expertise, TRESemme has been driven by a simple truth: every woman deserves to look & feel fabulous like she has just stepped out of the salon, every day. This range has been carefully selected for its advanced formula. Driven by our salon heritage, we work with our stylists to deliver expert solutions from salon quality products without the salon price tag. Using conditioner after your shampoo makes your hair beautiful but can also make it fall flat quickly. That's why TRESemme Beauty Full volume revolutionary reverse routine starts with a pre-wash conditioner. Formulated with volume lockers, the beauty full volume shampoo infuses bounciness and locks in beautiful salon volume that lasts up to 3 days. Long lasting volume for up to 3 days. Explore the entire range of Shampoo available on Nykaa. 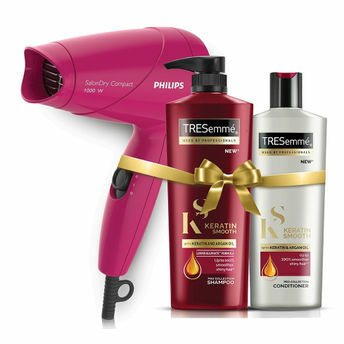 Shop more Tresemme products here.You can browse through the complete world of Tresemme Shampoo .